The best cleaning you’ve ever had. Period. We are carpet cleaners extraordinaire. Beyond Carpet Cleaning has been cleaning for over forty years. We are the guys the top realtors in town call when they have a catastrophe and the others guys in town cheesed things up. 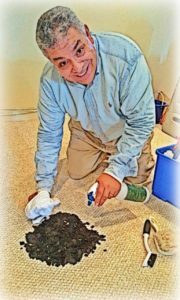 We are the guys other carpet cleaners call when they want their commercial jobs done right, and their techs don’t have the know-how. I asked this carpet cleaner you may know, “what are you gonna tell the neighbors when they see our trucks in your driveway?” He told me, “I’ll tell them I just wanted to see your method.” Must be a slow learner. We’ve already been out to his place three times. We are friendly and knowledgeable. Certified and insured. Better yet. We actually listen to what you want, take notes and tell you exactly what you can expect. We are also murder on spots and stains. We get them out, and they stay out. And if they don’t, we come back and take them out for good! The largest carpet cleaning supply house in the country is near here. The owner could call over a thousand cleaners here in IL to clean for him and his friends. He calls us because we’re old school stubborn on dirt. “Jimmy and his people are the nicest carpet cleaner’s we have.” said one of the managers at this cleaning supply house. He recommended us to his dad even though they had a regular cleaner. Now we clean for him, his dad, his aunt and anyone else who comes along. We take the time to clean right. It dries fast and if spots come back so do we. We want you happy, so you’ll recommend us to your sister and your mother and the neighbors whose dog is always having accidents. We can take care of that too. If you’d like to hire a company that is polite, respectful, and has people that are nice to be around, you want Beyond. We’re better than the last guys you had over. A lot better. Just read our reviews on Angie’s list, Google, Yelp, or our own website. Or you could ask your neighbors too. Going beyond your expectations for over forty years.